Rajshi offers its customers fully machined and well painted castings to their provided specification and colour. 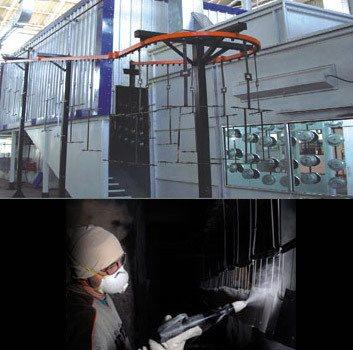 Semi automatic Powder coating booth with digitally controlled temperature based gas fired oven gives best quality powder coated parts. Water Treatment particularly degreasing and alchrome are done prior to powder coating with standard process followed worldwide. We are like a vertically integrated foundry as fully finished parts comes from single source right from casting, machining and surface treatments. UV resistant coating which can pass more than 1000 hour Salt Spray testing. To assure the required level of coating instruments like Coat thickness meter, Chrominence meter, Gloss meter are used.